These short shanks are suitable to attach taps to our Kegerator fonts. 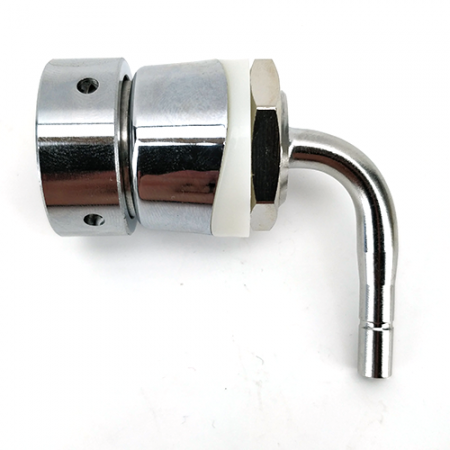 Can be used to replace the short shank on any 3" diameter tower. If you have received this in your kegerator package and still want to use a stepless clamp. Good news! You still can, just use needle nose pliers, boiling water and a positive mindset to get the hose over the barb. NOT INCLUDED but highly reccomended for 8mm OD beer line. KegLand is proud to introduce the much awaited duotight compatible Short Shank in Stainless Steel. Now the dreaded heating of hoses and stretching them over a barb and clamping them without a proper stepless clamp tool is a thing of the past. A complete push in Kegerator set up could be yours, or a custom jockey box font set up. Or upgrade the barbed short shanks you have now with our EVABarrier Double Walled hose with duotight by your side. If you have received this in your kegerator package and still want to use a stepless clamp. Good news! You still can, just use needle nose pliers, boiling water and a positive mindset to get the hose over the barb. These short shanks are suitable to attach taps to our Kegerator fonts. Can be used to replace the short shank on any 3" diameter tower. - Stainless Steel Shank with a 6.5mm duotight compatible barb. Common tips for cutting your beer hose for optimum flow resistance.